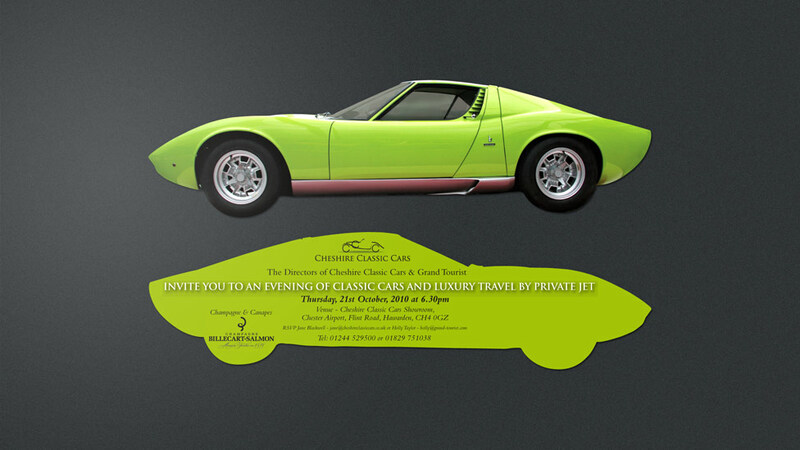 We created a unique event invitation design for a joint promotional event hosted by Grand Tourist and Cheshire Classic Cars. The event invitation design had to be created in a way that would immediately capture the attention of a sophisticated audience. We based the invitation design on a profile photo of a classic Lamborghini car. The design is simple yet striking and perfectly appeals to the target audience. Using specialist print and finishing techniques such as die-cutting and digital printing, we achieved a unique event invitation design that exudes exclusivity and generated demand. an innovative direct mail piece, and a travel guide that gets audiences closer to their destinations. The promotional event invitations were distributed to key potential customers in personalised envelopes – another highly engaging touch. The event was a real success for both Grand Tourist and Cheshire Classic Cars, attracting a very high turnout.